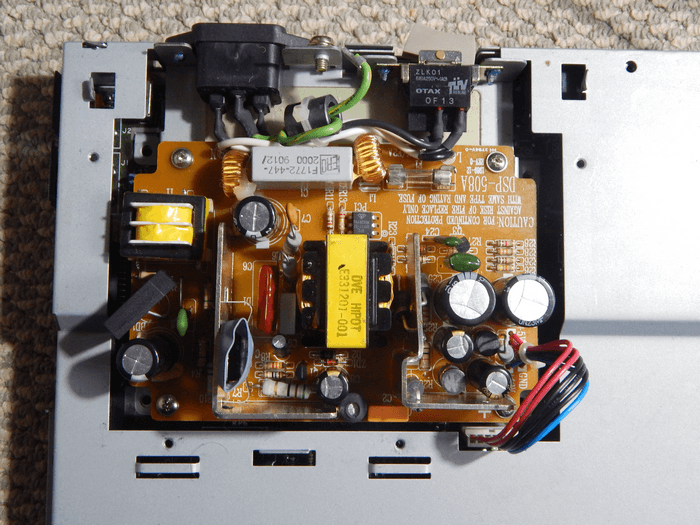 If your ST/E machine is suffering from random crashes, poor video, random hard drive or floppy access problems, noise in audio, then chances are your PSU is going bad. Considering the age of the PSU's now, it is of no surprise that they are in desperate need of updating. Please note all of these are UK/230V types! 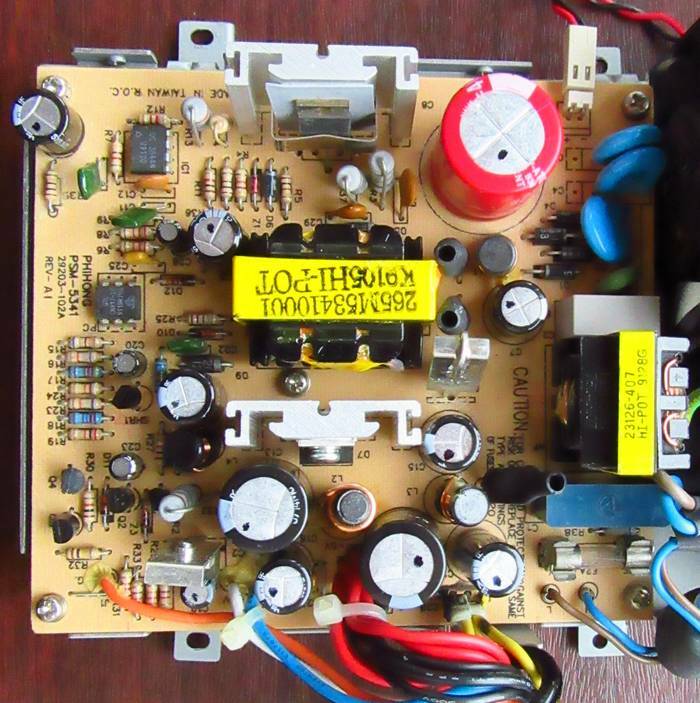 I will also add more PSU and fixes as I come across the various PSU types. All capacitors used are carefully chosen for reasonable cost and very good ESR ratings. I sell kits to update the PSU's listed in my webstore along with reconditioned & upgraded PSU's. Considering the age of these PSU's now, the ones which still have good regulation are likely to get my recommendation. I like PSU's which have the BU508 transistor as its a good rated device over the smaller TO220 based transistors. Though regulation is the most important quality overall. 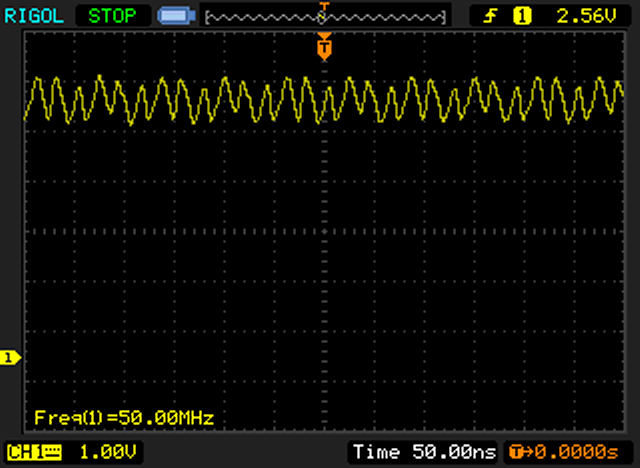 I have noticed the scope waveforms are not totally reliable in seeing PSU problems. For example, on some PSU's they appear to show good regulation, though when accessing the floppy drive, the screen brightness dims up to 50%. There seems to be a lack of "on demand" power from a lot of PSU's. I had tried initially adding another 4,700uF on the 5V rail to give it more on demand peak power, but it had little or no change in screen dimming. If you have any PSU's other than those listed, then please take a clear hi-res image and send it to me. It would also help to know any model/revision numbers on the PSU along with the number on the main switching transistor. Also a list of the main electrolytic capacitors is helpful. If you have any ST/STE PSU's not listed and would like to donate them for inclusion here, then please get in touch. If anyone has the circuit diagrams for any PSU's listed then please let me know. NOTE2: I keep getting asked about part numbers I use for these kits. Unfortunately I do not list them anymore simply because by the time I have sorted part numbers out and updated my site, the part numbers are no longer valid or discontinued. 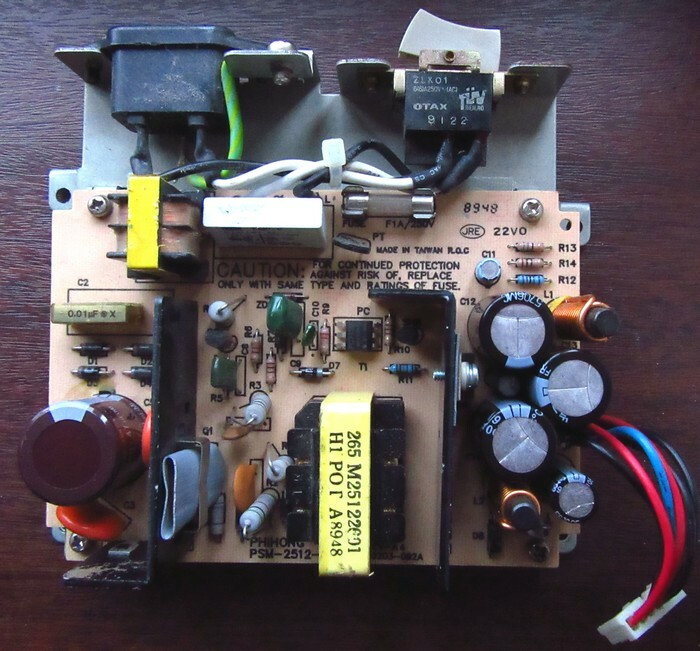 With several PSU's now on this part all needed various capacitors, it would be a huge undertaking to keep updating this page (time I just do not have unfortunately). Generally I go with the Panasonic FR series as they are really good ESR values. Please don't fit "any old capacitor sold around the Internet" as the cheaper capacitors are not suitable for switchmdoe designs and can easily overheat or explode! I am trying to update my store with new re-cap kits so please keep checking there. WARNING - PSU's do not operate correctly without a load connected. 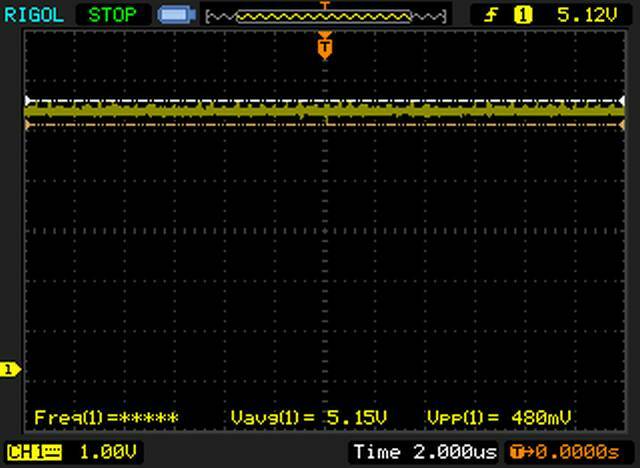 If you try to measure voltages without the PSU connected to the ST, then the PSU will likely malfunction. If you want to test outside of your ST, then you must load the 5V and 12V lines with a 5-10watt 5V & 12V lamp or resistor. Resistor would be 2.2R - 4.7R 10watt minimum for 5V and 22R 10watt minimum for the 12V. DISCLAIMER - Mains voltages can kill. 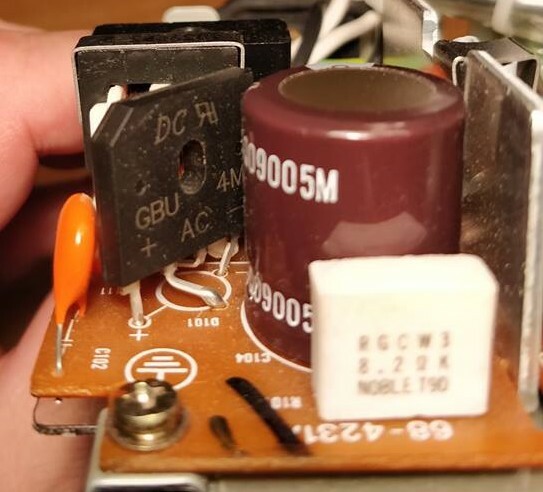 Capacitors can explode. I do not accept any responsibility for anyone doing repairs to these PSU's, and the user doing any modifications or repairs do so entirely at their own risk! Only a qualified electronics engineer should attempt such repairs. Here is the output of the 5V line. This is actually very bad as it has about 1volt of ripple. This means the power supply is fluctuating between 5volts and 4volts constantly. This will cause random ST crashes and in some cases could totally kill a ST! Here is a list of new parts. 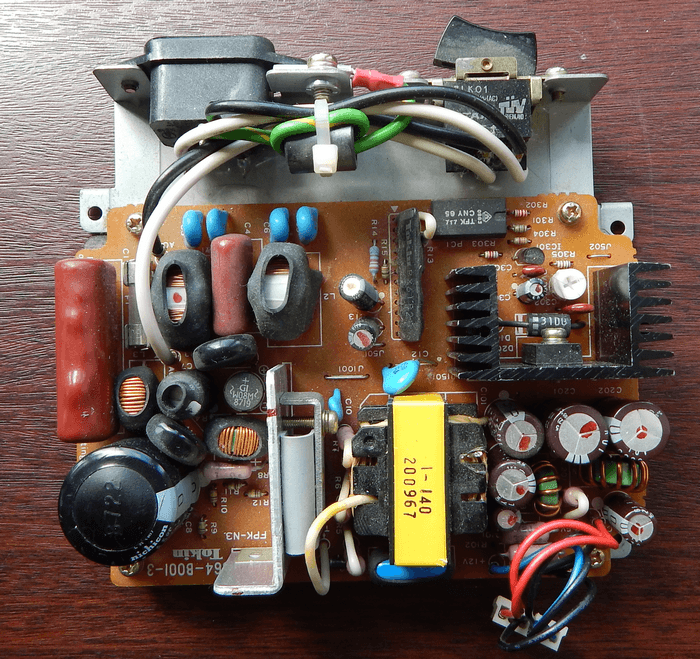 Some items on the Atari PSU are 10V but these were replaced with 16V types. The values were also increased to be able to supply larger current demands due to "add ons" and better stability. Also these are not "cheap" capacitors. These have been carefully selected to give maximum ripple current and low ESR values. 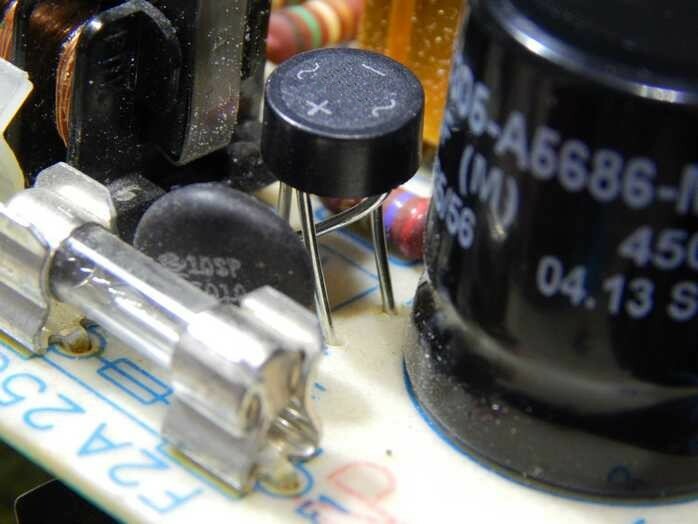 Cheaper capacitors may well make the results worse than you could start with, so using good capacitors is always a must. EEUFR1C152L CAPACITOR, RADIAL, 16V, 1500UF - Replaces all 1000uF caps. EEUFR1C472 CAPACITOR, RADIAL, 16V, 4700UF - Replaces all 2200uF caps. Just out of interest the old capacitor values were measured. 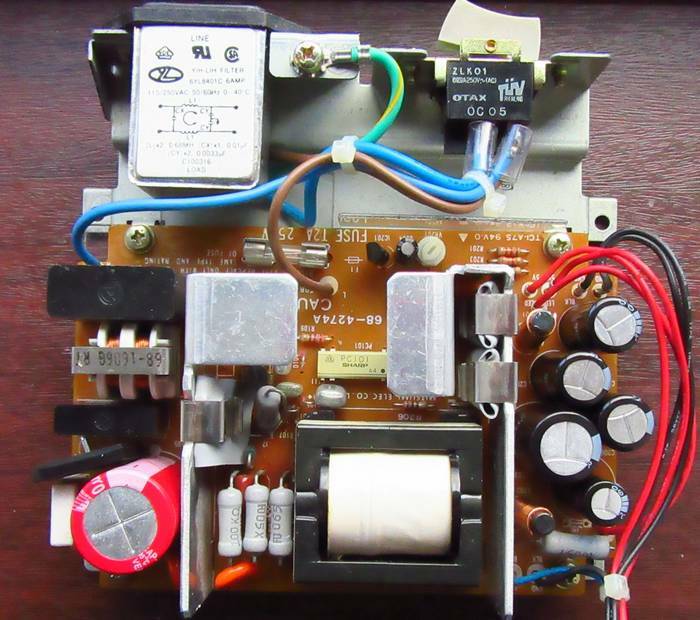 The main switcher transistor is 2SC2979 800V 3A 40W. Rectifier fitting example submitted by Jonathan Whiteside. Also worth nothing the Rectifier legs were slightly larger than the holes in the PCB. These were carefully drilled out using a 1mm drill bit. No damage was caused to the pads as I guess the holes were already 0.8mm. Also note as the capacitors are lower ESR values, and higher capacitance, this will put extra strain on the rectifier on turn on. 10A is a overkill, but I would suggest no less than 5A 600V type be used. The new 5V line, Here we can clearly see the huge advantage in updating the PSU. 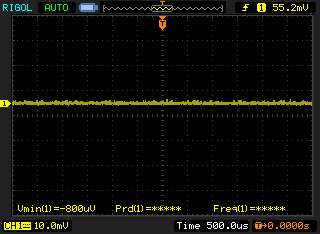 There is about 400mV (0.40V) of noise on the 5V rail now, which is about as good as things get! Overall the stock PSU is in desperate need of capacitor replacements. Once changed it has very good regulation and peak power demand isn't to shabby. There is slight dim on display during floppy access, but a lot better "peak power regulation" than some other PSU's I have seen. I have found the SR98's peak current demand isn't as good as it could be. This is generally seen as a dim on the video when the floppy drive is being accessed. So I started to look at this issue. At first I changed the opto coupler for a faster one (actually same one as used on the ASP PSU) thinking it would give a more rapid response time, but it changed nothing from what I could see. I later changed it back (after doing all the tests below). The faster one might be slightly better in regulation, but it is so slight its probably not worth changing. I then started to follow the resistor networks on the PCB and found that there is a capacitor which is pretty much directly across the opto's emitter diode. What this would mean is there is a small delay when the voltage is applied to the diode as it has to charge up a 1uF capacitor. It would then mean the 1uF would delay in turning off also. It is difficult to exactly work out whats going on with the diagram but I did notice when the 5V was turned up to 5.5 - 5.7V things improved a lot. For this test I used a STE. I always had some odd ghosting on it and wavy lines on the screen. 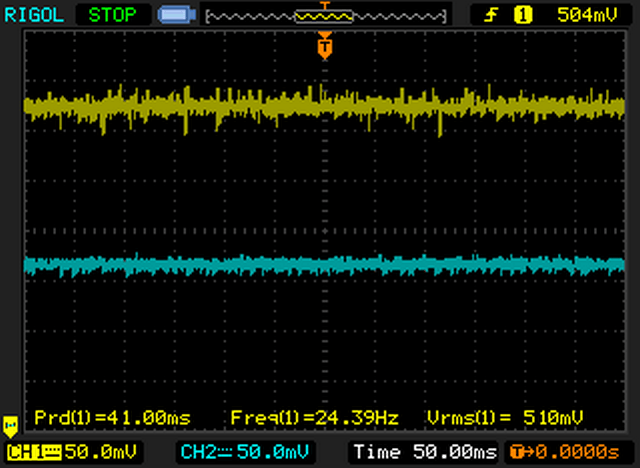 When the voltage was turned up (way to high in fact for 5V) the video noise problems and ghosting pretty much went away. Though I did notice some odd juddering on the edges of objects afterwards. But the most interesting thing was when the floppy drive was turned on, the video did not appear to dim as it did before. So I found 2 resistors R201, R202 which seemed to be a voltage divider which also goes via the preset pot. This divider then is feed to a small transistor which in turn charges the 1uF capacitor to the opto diode. R203 is in the mix aswell, seems to be another resistor in the 0V line to the transistor. 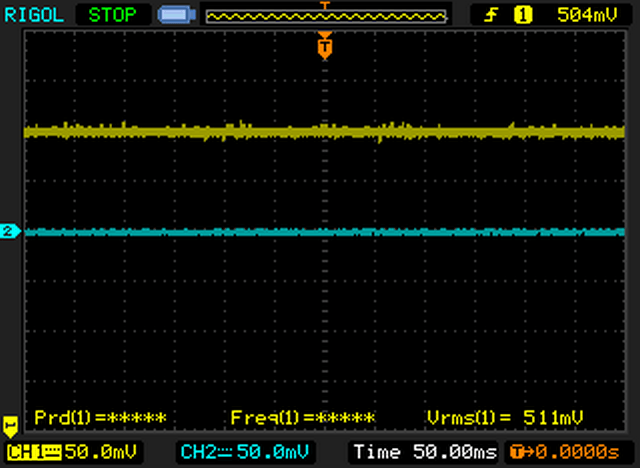 In anycase, I added 10K resistor across the top of R201, R202 and now the video problems went away at 5.25V. Also the dimming problem is not there. Any lower voltage then all screwy video problems come back. So clearly there is a biasing problem. I have also replaced the 1uF with a ceramic to rule out aged capacitor issue, Though I am not totally sure it made a difference. 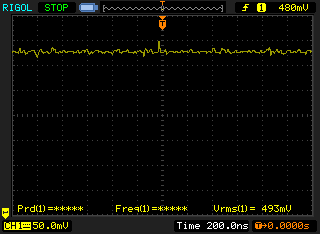 Overall how it looks is when the PSU gets under load rapidly (when floppy motor turns on) It takes to long to charge the 1uF capacitor and the voltage drops (actually only about 0.02V) but this is visible to a quick eye that the video dims. So the idea is to increase the current though the circuit to give a faster charge rate of the capacitor, which will turn the opto diode on faster, and this does seem to be drastically improving stability. So the final round up. The trimmer pot may need to be adjusted back to 5.00volts on the 5V rail. The output diode in the LV side is a HRW34. Not a bad spec but gets pretty hot on the heatsink plate. So I looked around and found a better one a STPS10H100CFP. This one is much faster switching and offers a fair bit less voltage drop. 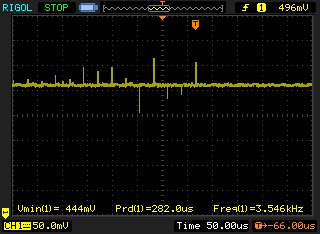 After I recapped a SR98, I took some new readings on the 5V rail..
After the diode change I got this..
Basically the "noise" had reduced by a drastic amount! I zoomed in a bit more.. 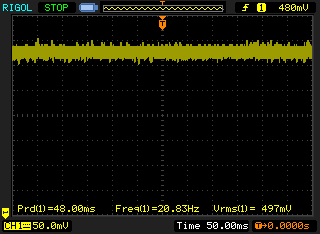 Here I now have about 200mV noise (0.2V) from about 500mV (0.5V) of noise before! Was actually amazed the regulation was improved by such a drastic amount! Temperature wise I got about 39C after about 10mins run time. The ripple may look really bad, but this was taken on 50mV range. 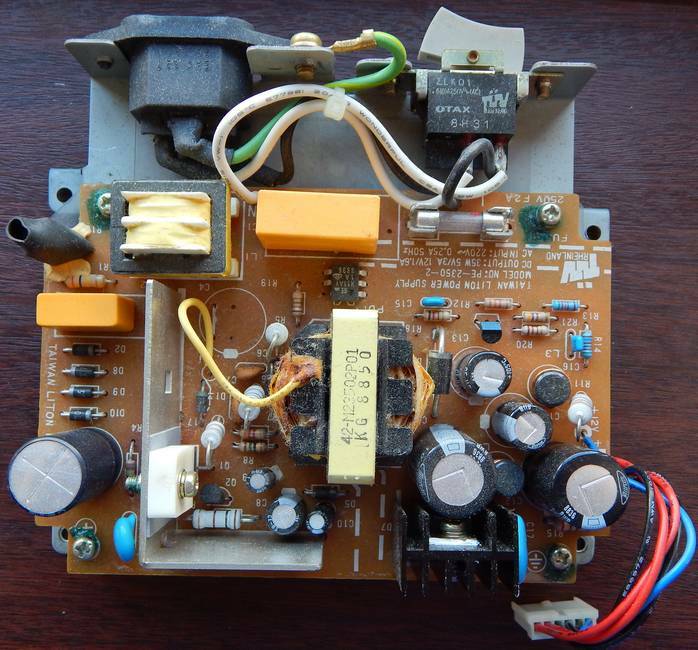 So this PSU would seem to have a lot better regulation than the SR98 PSU which appears to have around 400mV of ripple. Yellow is 5V rail. Blue is 12V rail. 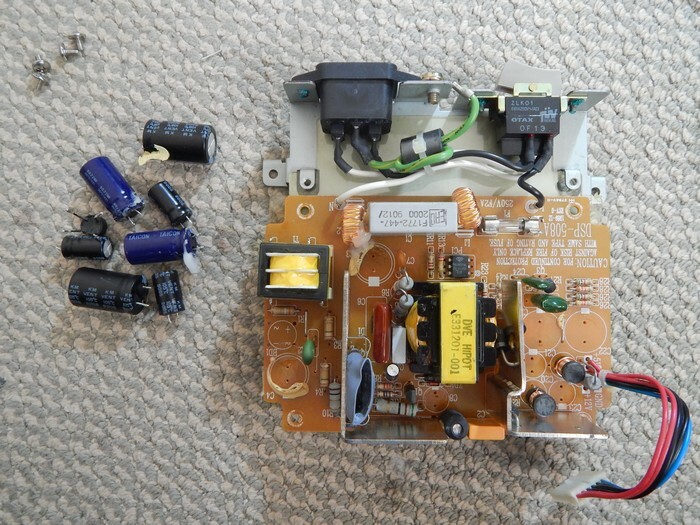 After one of my SR98's died, I found the main switching transistor had fallen short circuit. This is a 2SC2979 which is a little wimpy. 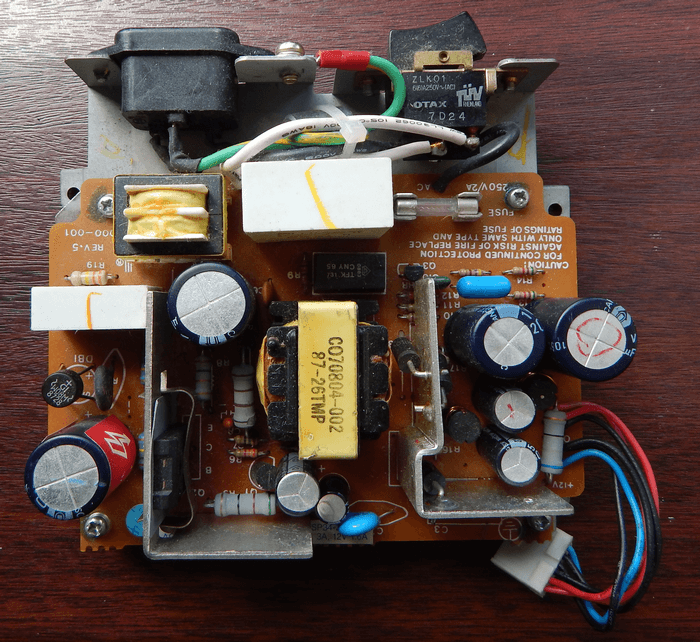 On the 508A PSU, it just so happens to have a BU508A transistor..
Voltage and current ratings of the BU508 are much better than the 2SC2979. Due to this I am inclined to favour the 508A based PSU at this time. Considering the age of the PSU and still very good ripple figures and better switching transistor, It is probably one of the best PSU's I have seen so far. It is also worth while re-soldering the BU508 legs. Anything which gets hot in fact should be re-soldered. Anything which looks suspect should also be re-soldered also of course! I took some better images on how to fit the rectifier. The good thing is the holes did not need drilling which is another plus point of this PSU! Click on any of the 3 images below for a higher resolution shot! A small improvement which means the new capacitors are doing their job :) The difference is not huge, but that was to be expected considering the PSU was in pretty good condition to start with. Regulation is below 200mV which is pretty good and no noticable dim on video during floppy access, so peak power is very good also. Main transistor is the BU508. Regulation on the ASP PSU seems to be struggling a bit on first glance, though probably down to aged capacitors. The PSU make a fairly loud ticking sound, probably 4 or 5 ticks a second which is a little unusual. This PSU dims on floppy access much like the SR PSU, though it is only slight. After updating the capacitors the results were interesting. The screen dim on floppy access was almost not noticeable, so great improvement there and peak power seems very good. Probably the best I have ever seen. The overall regulation seems to have gone a fraction worse at 500mV and slighty worse than the SR98. I can't really see much difference other than the REV5&6 have C3 missing and a small diode on the bottom right. C3 & C2 seem to do the same job, just a coupling capacitor to the chassis. The diode seems to be in series with the 12V line. Not sure why, could be protection on early machines or the 12V was to high. In anycase, the diode is hardwired over on the PCB itself in later revisions. I did noticed on 2 REV6 PSU's that some resistors near the BU508 were different, only by package. 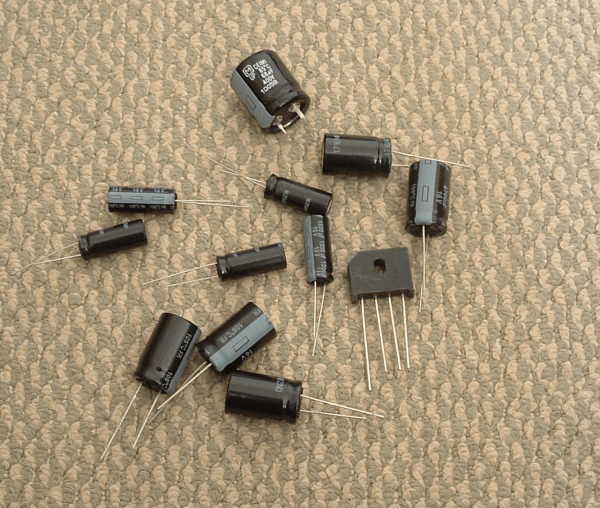 Though also Q1 which is normally a small package C1384 transistor is a TO220 packaged C2331. 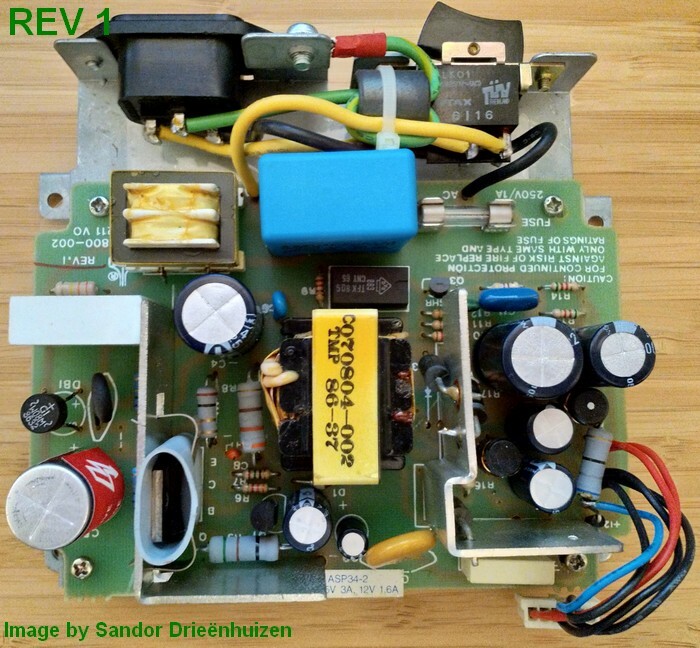 This is the first PSU I have seen, its possible it could have been repaired previously or the manufactures decided to use different parts during the REV6 run. I will keep a eye out for more PSU's to see if this is a common thing done. I re-tested the REV3 Vs REV6 and did not see any difference. The diode on the REV3 12V is a little lower at 11.52 Vs 11.55V on the REV6, but that could be PSU tolerances. The 5V regulation doesn't seem any different either. The oddball V6 Variation doesn't seem to operate much different. Its hard to say, but the regulation may be a fraction worse but again it could just be PSU tolerances. 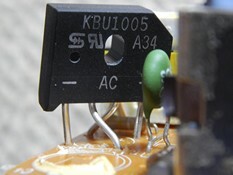 Main transistor is 2SC3460 800V/6A . I had to look up the specs on that one as I had not seen it before. Overall its a good device, good voltage and current rating. Not as good as the 508 but comes in a close second place. What I noticed about this PSU is that when the floppy drive was first accessed it caused screen to dim by about 50% as the drive motor powers up. 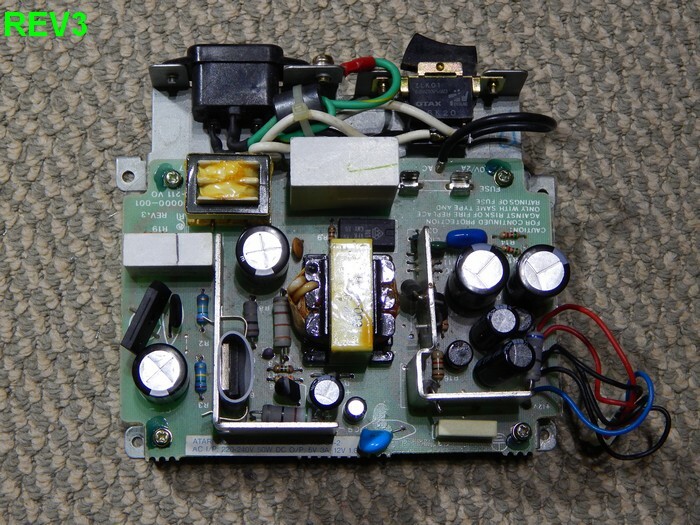 I had seen this before though assumed it was due to the capacitors not delivering the peak power needed. So I added a good ESR capacitor 4,700uF onto the 5V rail and it did not improve matters. So while this PSU appears to have reasonable good regulation, at around 300mV! its peak power capability seems very poor though. So far this PSU is probably the worst PSU I have come across so far. It would be possible to update the PSU, though as the capacitors are so squashed up with no margin for error, then I will probably not do any fixes for this PSU. I have not seen many of this type so I do not think it is common anyway. Thanks to qq1975b for submitting the Falcon PSU image. Main switching transistor 2SK1507 - N-chan mosfet 600V 9A. One thing which is a little odd about that mosfet is it has 0.850R resistance which is about as high as I have ever seen. While these PSU's are 20 years old , I would have expected something a little lower. Though there is nothing wrong with that in itself as it is mostly heatloss on that figure. The really odd thing thing is the turn on time which is around 100uS , I frown on 100ns parts nevermind 100uS. So not really sure why the turn on times are incredibly slow. Without knowing the ins and outs of the design there is no way to tell. The transformer itself says input 50/60hz, with all the delays of the mosfet, it probably makes around 3,000Hz switching cycle. So possible the slow mosfet is done deliberately to better match the transformer. I can't help but feel this shouldn't be how switchmodes should be operating. The other heatsink as a dual diode attached. As this gets warm also I had a quick look at its specs and found it has a pretty low voltage drop of 0.55V. Looking at modern parts, this is pretty hard to beat! 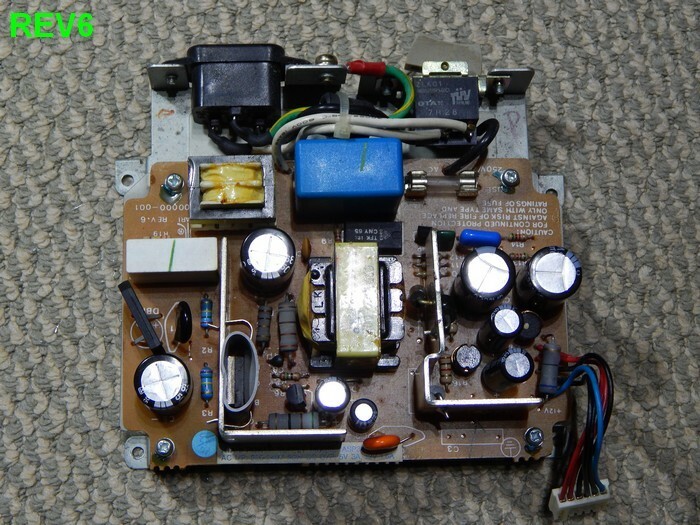 The rectifier, well, I have not known any of these to fail, but it is only a 1amp bridge which seems a little odd as its got a 2.5A fuse on board. Saying that, its peak current is 30amps so probably more than good enough. I've never personally been a fan of 1Amp rectifiers on mains, so I would have liked to have seen at least a 2amp part in there. But of course that is my own personal preference. So lets get the scope out and see whats going on :) Tests were done on a stock machine with only the floppy drive connected. The overall regulation on initial glance looks good. On closer look, it has about 100mV of overall regulation which is pretty good. 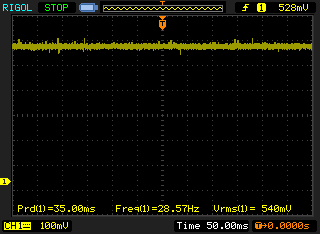 Though I did manage to capture some 600mV (0.6V) spikes which could be higher or lower than the overall regulated voltage. 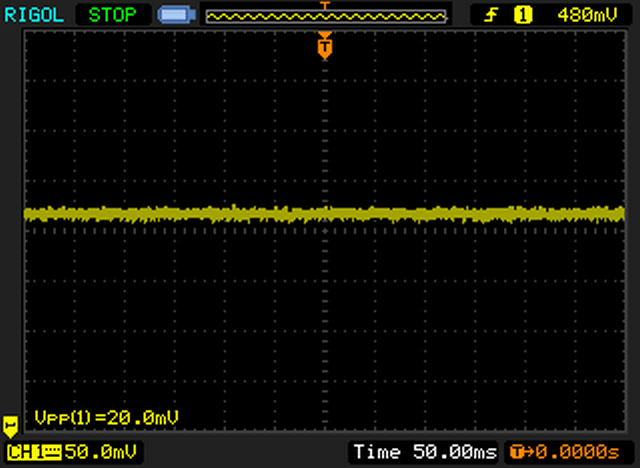 This gives about 1.2V of spiky pulses. 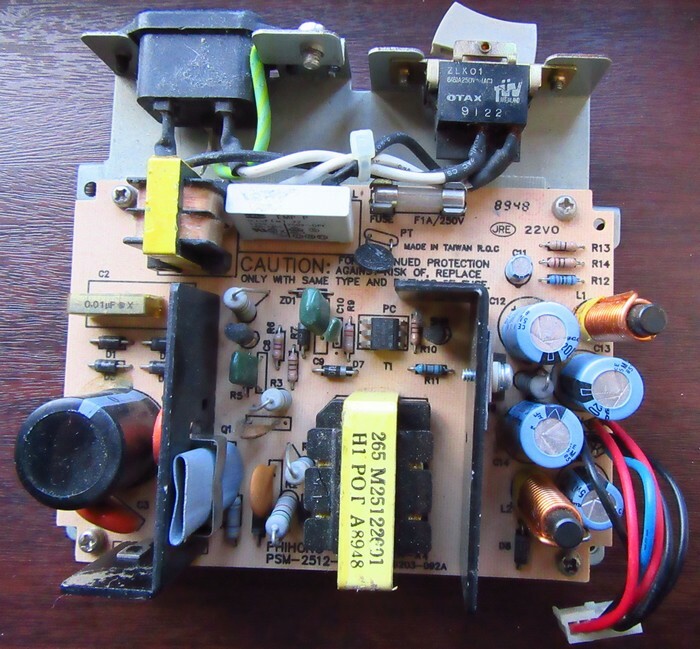 Pretty bad, but we must think this PSU has been used for years and has aged. There does not seem any apparent voltage drift even when the floppy drive turns on. So regulation and peak power is very good. So time to upgrade and see how things turn out afterwards..
What can I say other than simple "wow". Those voltage spikes have totally vanished and regulation is a amazing 20mV! Clearly the aged capacitors were not delivering peak power which they now do thanks to Panasonic's ultra low ESR capacitor range. In conclusion, while this PSU has a bit of a WTF on parts used, clearly whatever the manufacture did works, and works very well indeed. For a simple switchmode design, this PSU really does punch out some seriously good regulation. I did some more experiments trying to work out the max output current of the PSU. So checked the Falcon's current pull from the PSU..
Machine is a stock machine. Floppy drive and 14MB ST RAM only. So its not really far off a stock STFM really. 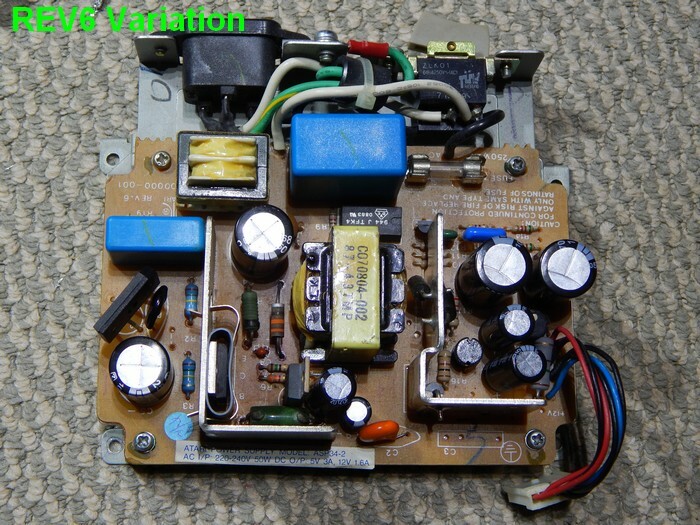 Depending what voltage the PSU is on the ST's 5V rail (IE 4.8 - 5V) its about 1.8A - 2A. The Falcon transformer itself has 5V 7A, 12V 0.2A stamped on the side. So in theory it could push that output current. 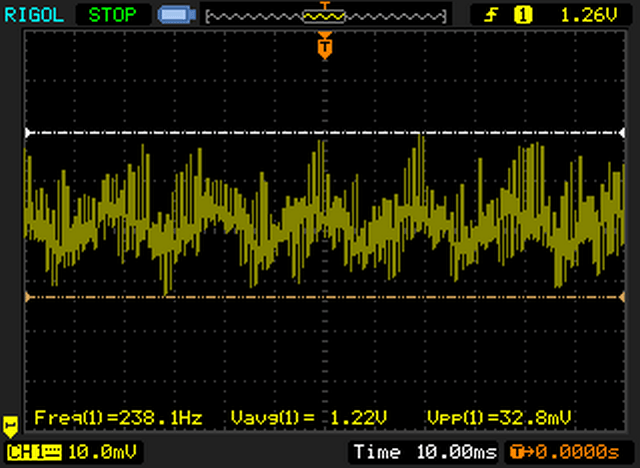 Though that is assuming 7amps is RMS current. 5 x 7 = 35watts..
230v x 0.45 = 103watts. So really, round up the wattages, to say 40watts total output with 100watts input.. thats 60watts loss across the transformer going by those figures. I start to frown at 2watts heatloss.. Though I'm not surprised at that, basically 40% efficient which is probably about right. Overall, the PSU is probably capable of 7amps on the 5V rail, but I doubt it could sustain that without overheating badly. My next tests is get my rheostat resistor and load it at 2amps and see how hot the switcher gets temp wise. Regardless of what the PSU is "capable" of. I would say 50-60C is as much as I would be happy at it running at. In hotter parts of the world, its probably 50C here, is 80C+ in hotter areas of the world. So almost 18C from 2amps to 4 amps. I would guess 6amps would push around 100C. So I think the PSU could actually push 7amps without to much trouble, BUT, its not possible as the thing would simply run to hot. If it had a fan on top yes.. probably..
One thing which makes the tests not fair exactly, is that feking metal PSU cover. Over time heat builds up and could probably push the temperatures up by 10-20C easily. Also it was a cold day here, 18deg ambient. so for 2amps, its like 48.5-18 = 30.5deg temp rise at 2amps. If it was 30C ambient, then it would make 60.6C temps. Add that under the metal cover and you probably would hit 70-80C. IMHO I'm not a fan of stuff running hotter than 50C. Though most semis these days are run at 80-120C.. So conclusions ? eye of the beholder I guess... I would suggest if anyone is running more than a stock machine to remove the metal PSU cover, it will keep temps a lot lower. Overall, I would say 2-3amps is about which is realistically usable on the PSU. Parts I supply in my upgrade kit as sold in my STORE are as follows. I only supply quality low ESR Panasonic capacitors in my upgrade kits. Please do not source them from dubious sources around the Internet as there are to many fakes about. Only use reputable supplies such as Farnell. Do not use generic or low cost capacitors and your PSU will likely become damaged or causes damage to you precious Falcon! I mostly supply SIP type rectifiers but this turned out to be a small nightmare as there isn't physically room to fit it properly so I opted for a smaller round type. unfortunately the Falcon PSU rectifier has a nonstandard pinout so fitting a modern one is a little tricky. Please do not attempt this upgrade unless you are reasonably competent at soldering and understand basic electronics and also understand the risks of working on mains voltages equipment. The capacitors are pretty much self-explanatory in fitting, only the rectifier is a little more tricky as the pinout is different on standard rectifiers..
Make sure you get the + and - markings on the rectifier match the markings on the PCB. 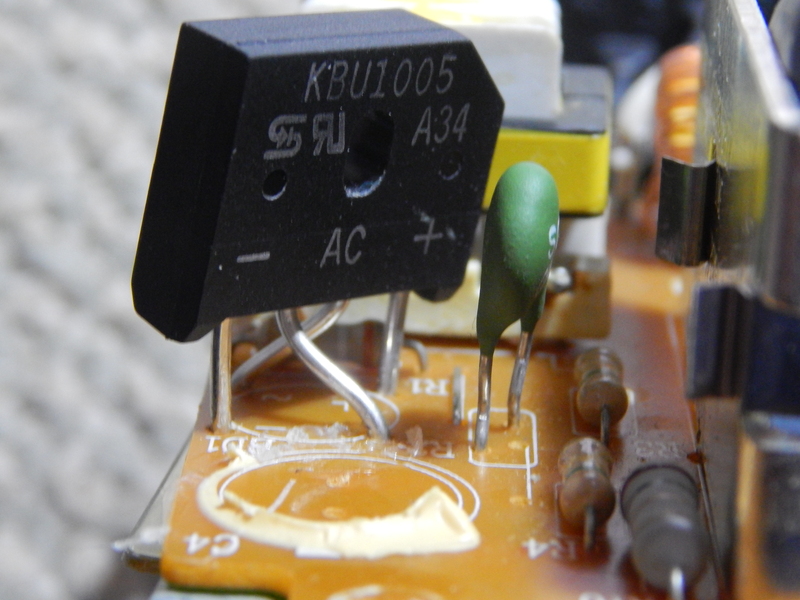 Not the rightmost pin on the rectifier as down on image bends under and over to the bottom left hole on the PCB. Take great care none of these legs are touching ANYTHING else otherwise the PSU will likely explode! Once you are 200% sure you have the rectifier installed correctly. Gently push it down as shown in the image above. DO NOT PUSH IT FLUSH TO THE PCB! Leave it sticking up so none of the legs bend over to the point of shorting out. DOUBLE CHECK NOTHING IS SHORTING OUT BEFORE POWER ON! 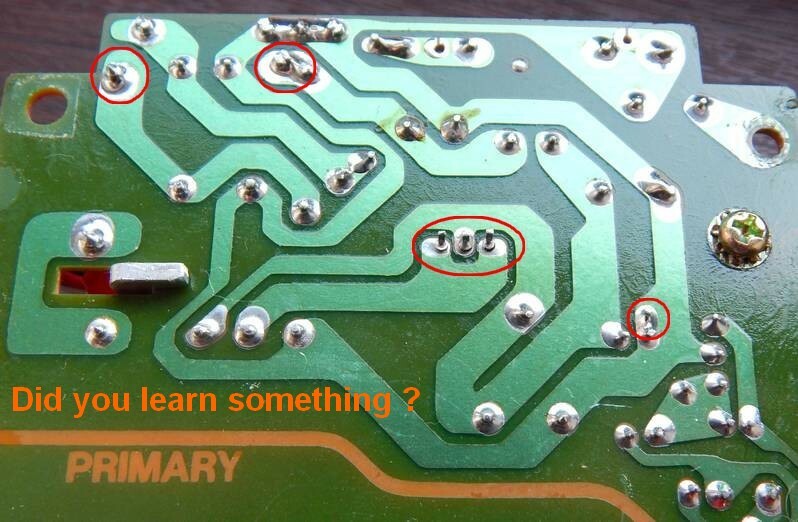 Once done resolder any joints on the PCB which look as though they are bad. 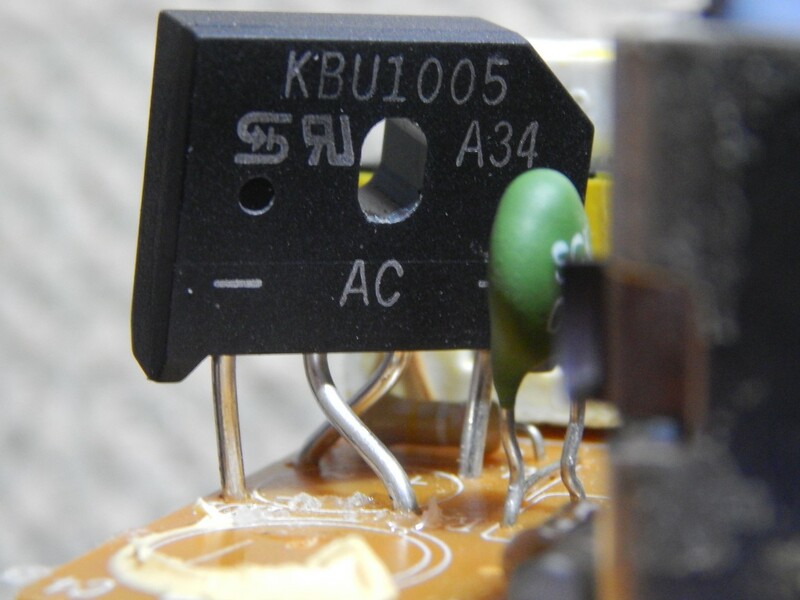 Make sure you resolder the transistors which are mounted on heatsinks and if in doubt, resolder! I would strongly suggest to test the PSU with a load resistor or a lamp and measure the voltages before replacing it back into your Falcon. Falcons are a rare bird and not cheap to replace if things go south! 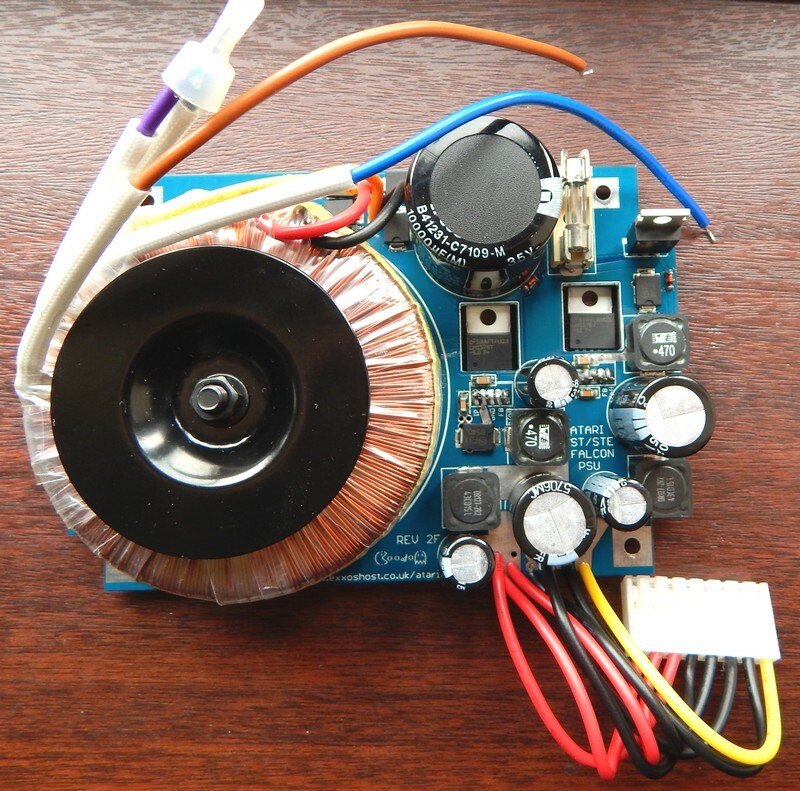 A 12V 24watt lamp loaded on the 5V rail should light up dimly and load it with about 1amp. This one has the C4233 switching transistor. 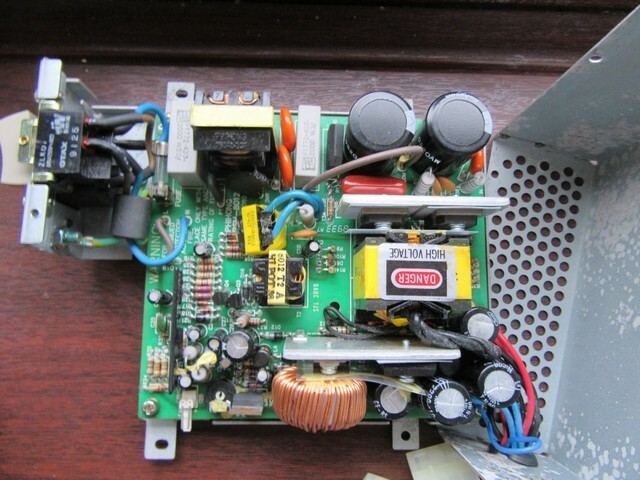 A quick look shows its a 3A NPN 60W. 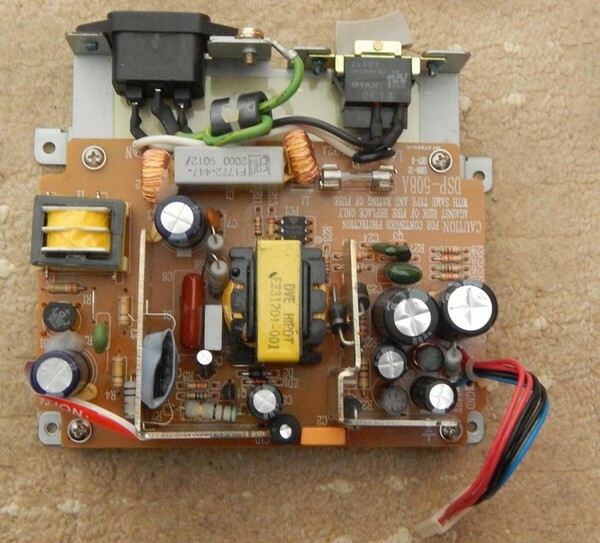 So Almost the same as the 2SC2979 (3A 40W) as used on other PSU's. I powered up a stock STFM like in my other tests and took a scope image, and I must say I am impressed already. Considering the age of the capacitors and the ripple being only 200mV that is probably the best I have seen on a Atari PSU! Another fantastic thing is the floppy drive "dim" on the white background I can't notice a thing there. So the pulse power of this PSU is awesome. The main output capacitors are 2x 220uF 10V and 2x 220uF 25V. Awesome again as they are even 105deg caps! I swapped them for my favorite FR series 4700uF & 680uF and re-tested. Still the same regulation! Not surprised really as it was 200mV to start with. Main switcher 2SC3150 Similar to the SR98's 2979 only slightly higher rated. Peek current on floppy access isn't to shabby at all. The white dim is barely noticable. So good marks there. Pretty much as other PSU's. Around 480mV to 680mV. 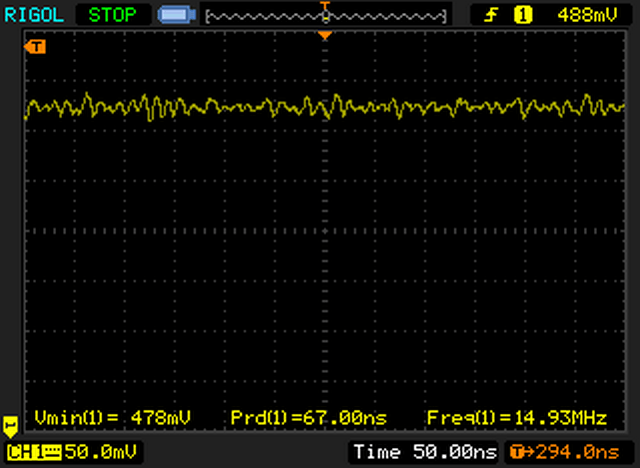 Now we have about 160mV of noise which is pretty good and actually beats the DSP508 in regulation. The dimming is next to nothing as overall its a pretty good PSU once updated. 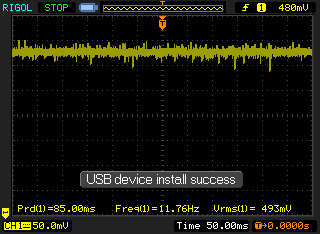 12V pulls 0.11A (excluding hard drive) 5V pulls 2.90A when connected to a MSTE. Above is the 5V rail. We are on x10 so noise is 176mV (0.127V) P-P. Its not to shabby considering the age of the PSU and the fact its under almost a 3amp load.. 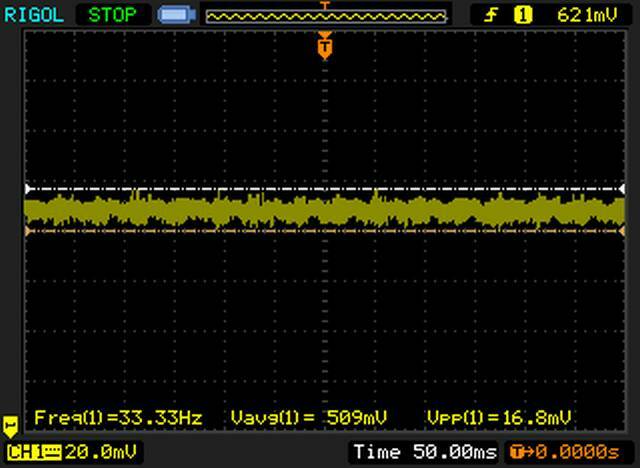 The 5V rail showed a fair improvement from 176mV down to 116mV noise. 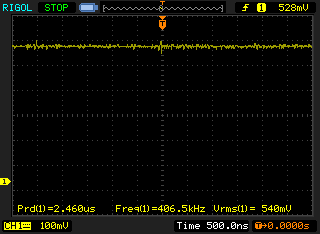 Looks like the ripple filter struggles overall, dispute the values of the capacitors being increased. It is overall a lot less "spikey" so its a good as things are likely to get with the 5V rail. 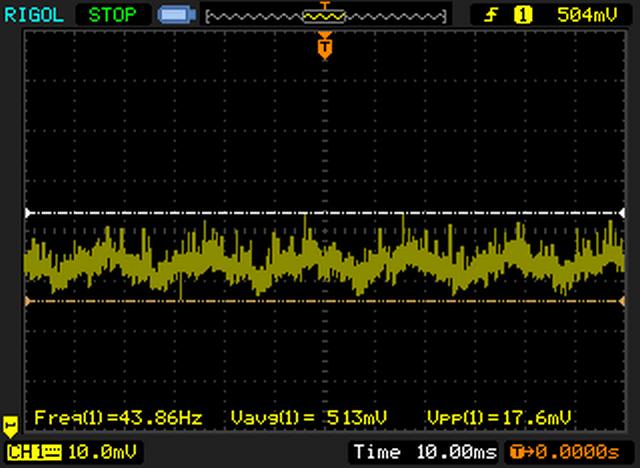 The 12V still looks spikey, though likely due to the hard drive motor causing this noise. Here we dropped from 384mV to 328mV. A fair drop down but would have been nice if the PSU showed better results. Overall, the MSTE PSU I had for testing had fairly good regulation before the recap. Though the usage of the PSU was unknown. I suspect the machine had not been used all that much as everything inside the MSTE looked almost like new. Clearly there is a improvement with the re-cap kits and likely machines which more use will show better improvement. As the MSTE is a rarer machine I think its worth while re-capping with quality capacitors to ensure the motherboard gets a clean as possible power rails. *on to do list* to investigate. 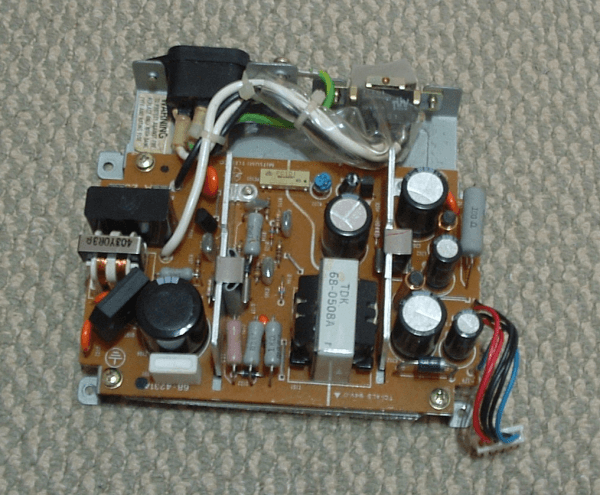 This PSU I assume is a later version of the SR98. It has a SR98 "feel" about it aswell. Most noticeably is the horizontal transformer and mains filter. A pleasant surprise that the main switcher is a 2SC3459 800V 4.5A 90watts. So a bit more "meat" in it over the previous SR98 transistors. Regulation seems pretty good at 80mV. Though there was some larger spikes which I was unable to capture, I would guess around 200mV. I didn't capture the 12V but it was similar. 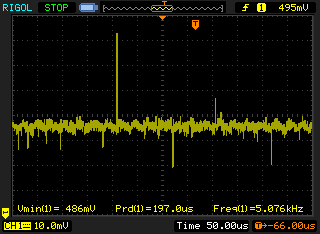 I did notice the 12V line increased in voltage a little when the floppy drive was active, but the 5V did not. So this PSU has some minor regulation issues. But nothing to worry about. I also noticed a lot of "dim" on the white when accessing the floppy drive. This is a shame as it was also similar on the SR98. 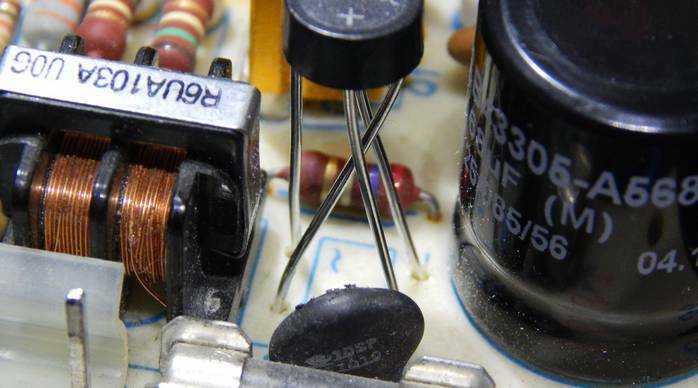 I would have hoped with a larger transistor that it would have been solved, but seems not. I did not take a image as the overall regulation was the same as before. Though the large spikes which I had seen before have now completely gone. The PSU seems to have good regulation overall. Whats worrying is the huge spikes (look at the Falcon PSU for a example) though due to the age of the capacitors its not surprising. Even though the regulation did not change after the re-cap, I still recommend a re-cap due to the spiking issues. 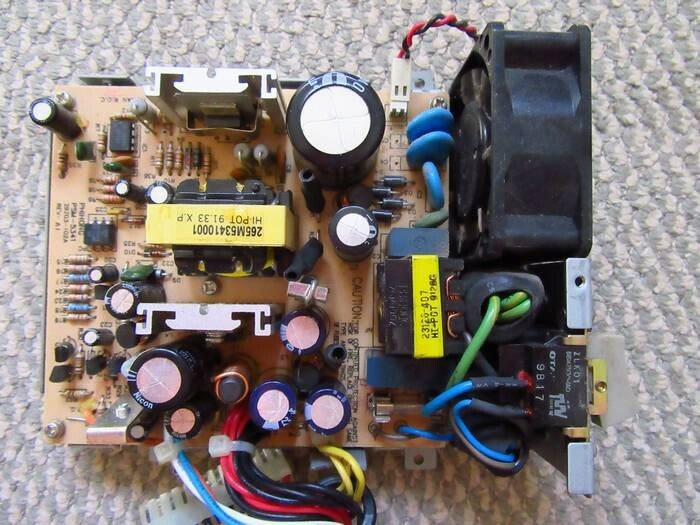 A classic example of a bad solder joint on a PSU. One of the main failures of PSU's is bad joints and should be resoldered even if they look good. 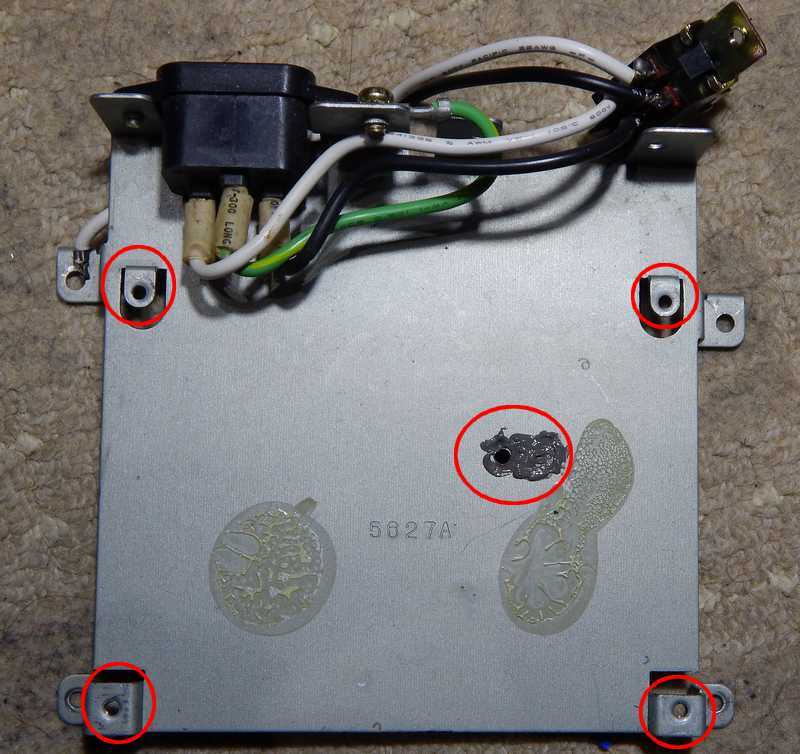 Click the image to reveal the bad solder joints..
5) Fix onto old PSU framework. 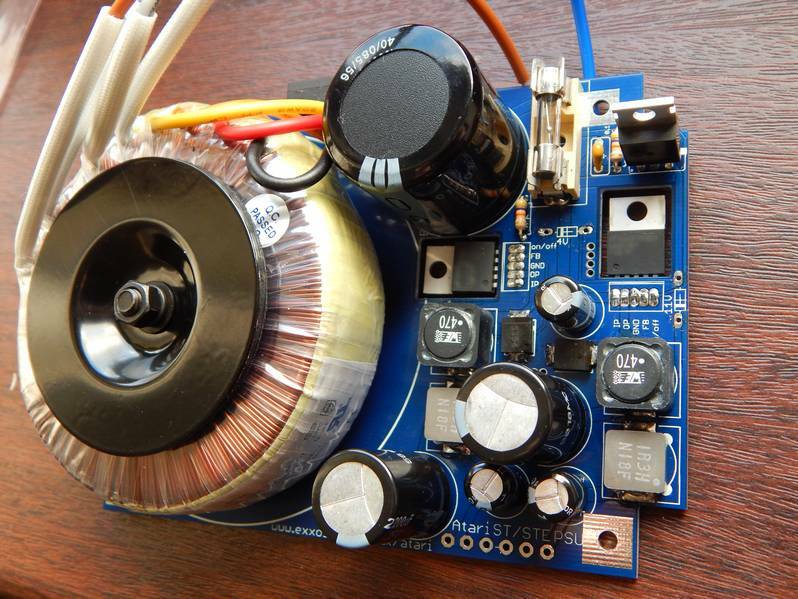 The "front end" is a toroidal transformer. I chose a 50VA type ( about 4amps output). These are actually pretty efficient and possible more efficient than the switchmode transformers and related losses. This also means no nasty high voltage switching transistors and everything is a safe low voltage operation. I did originally consider a switchmode instead of a toroidal, though likely a custom core would have to be manufactured to fit the design and this would ramp up cost to much. I did look around for "off-the-shelf" transformers, but there seemed to be little choice and some of them were actually very expensive. A cheaper alternative would be to re-use the transformer cores off the old SR98's etc though I think there would be little point in reinventing basically the same thing. High voltage switching ultimately results in a lot of heat loss in the transformer core and main switching transistor. Such transistors are prone to failure either due to high voltage spikes or bad thermal contact to heatink cause overheat. Overall, the toroidal while being larger, is a lot more efficient and more reliable than a high voltage full switchmode design. After working on switchmodes for several years and never really seeing a reliable design, I am a lot more confident that a full low voltage operation will be long term reliable and offer greater efficiency than the original ST PSU's. The regulators are switching regulators, so heat losses are kept a lot lower than using linear regulators. Switchmode regulators give better efficiency (less heat) and offer fast reaction times for regulation over slower linear types. Whereas the original switchmodes offered anywhere from 200mV to 600mV regulation, low voltage designs offer much tighter regulation and can even offer regulation down to just 2mV! One thing I almost overlooked, is when the original PSU's fail, DC is applied to the switchmode core and the output voltage falls to zero, which means the 5v & 12V rail fall to zero volts quickly. The down side of a regulator is there is no way to know how it may fail. Of course they should never fail, but I did not want to simple ignore this safety feature. So I have added in a "Crowbar" onto both the 5V and 12V lines. So should the voltage rise to high on either levels, the crowbar kicks in and will simply blow the onboard fuse and protect the Atari circuit form damage. The "black holes" in the PCB are to allow the regulators to be bolted onto the metalwork of the existing PSU base and used as a heatsink and a solid ground plane. The PCB is the same physical size as the original PSU, so will bolt down in all 4 corners as normal. Each screw point is now also used as a ground. This makes the groundplane out of thick metalwork which is advantage and is a free heatsink. The regulators should not get to warm anyway, so the metal area is more than enough for cooling. The hardest parts were the inductors. This always drives me nuts as there are so many terrible types on the market that I could write a book on it it, in fact I think I did write a paper on it at some point :) With physical size constrictions and cost being a factor, some small compromises had to be made. Mostly it is the heat dissipation of the inductor. I worked it out at less than a watt which isn't much really, but this could be reduced further with more expensive inductors, but the cost jumps up to like £10 a pop. 4 of them is £40 so you can see my problem there. Really though, the more expensive inductors just are higher current rated, so thicker wire, larger core, so wattage lost isn't as much. But not worth paying £40 just to save about half a watt of heat dissipation. Overall, it shouldn't get as hot as the original PSU's anyway. ...Of course about that point the internal current limit of the regulators will kick in. Regulators can push about 3Amps RMS like the Atari PSU, and have something like 6amps peak current. On short circuits the regulator will switch into a cycle per cycle shutdown mode which basically shuts down the regulator until the fault is removed. The transformer is 4amps rated so we shouldn't be pulling more than that in total anyway. 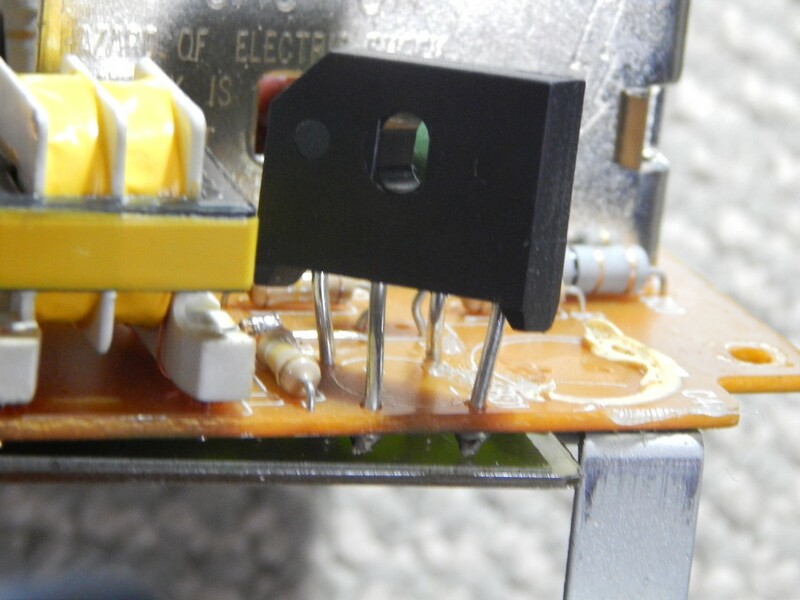 The limits are also physical space constrictions on the PCB, a 60VA transformer simply wouldn't fit. Higher amp switchmode regulators start ramping up costs also, so I stuck with 3Amps as its the same as the Atari PSU's. It is doubtful anyone will use more than 3Amps anyway. Diodes on the board are the lowest voltage drop Schottky diodes I could find. So this keeps efficiency as high as possible in that part of the circuit. Capacitors have about over 3-10amps amps ripple current so all good there. The main reservoir capacitor is about 10,000uF with added 2,200uF on the regulator outputs for best ripple regulation possible. Keeping the reservoir value high also helps with regulator stability and better regulation. Overall designing these things , like with most things, is one huge compromise with everything. I have tried to keep efficiency as high as possible and keep the regulation as high as possible , without spending stupid money on parts. Each time I build a few up I may tweak the parts used. If I find something slightly better for not much more money then I will fit it. Though with everything optimised already, such "improvements" are not going to have a huge impact on anything. Some parts not arrived yet (for the protection circuit) but enough to start testing. I noticed a voltage drop to about 4.8V under heavy load. This turned out to be the output filter inductor :-( Though after more testing it seems the inductor wasn't actually helping regulation anyway. If anything it was making things worse. So currently the inductor has been removed. While the regulations have a 2% output voltage tolerance, I got 4.96V under heavy load (about 2-4 amps) so well within tolerance. The open circuit voltage is 5.05V as shown in the image. The inductor gets a bit warmer than I had expected but that's the tradeoff with that size of inductor. It is only 0.06ohm so not bad compared to most. I keep looking for alternative, but the next best ones are flat coil wound types which are pretty huge and cost a lot more. If I ever do a new batch of boards I may try to make provisions to later fitting a larger inductor if people want to at a later time. Most likely the board will have 2 less inductors, so it frees up a little PCB space to give the option of a larger type. Though I've got 50 of these PCB's so unlikely a new design will be done any time soon. 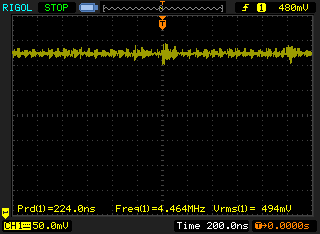 This may look insanely bad, but this is on a 10mV scale (0.01V) From what I can see there is a oscilation around 69MHz. I First though it was the self resonance of the inductor itself, though after looking on the data sheet it lists it as 6.5MHz. After much pondering, I tried another set of scope probes.. So here is the current test setup in case people are wondering how it fits together..
On the left is the "normal" figures with about 36mV of noise. On the right, I moved the GND of the probe closer to the motherboard and it went way worse! Now 137mV! More tests above moving the probe around. So I can vary the voltage "read" by moving the ground wire about. So I had a idea.. The issues were mainly because the probes picking up noise from the motherboard, so , remove the motherboard :) I have a 200watt 20R rheostat resistor so used that instead. 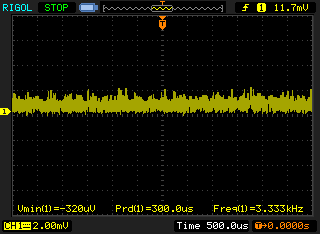 I pulled about 4amps of current on the 5V rail and got just 20mV of noise! (0.02V) This is exactly the same with or without a load. So this design has some serious good regulation from 0-4amps! Now I am working more "as expected" I revisited the ripple filter. Images show with and without a 1uH filter inductor. The data sheet suggested 22uH but with the voltage drop of over 0.2V its just not viable to use a large value without a drop in voltage across it due to its winding resistance. So next up I will try and find a higher current inductor of maybe 1-2uH with less resistance than my test inductor. This way it will have better ripple filtering without the voltage drop (hopefully). New filter inductors in place. 18Amps rated 0.0013ohm so voltage drop is basically zero. While a higher value inductor would act as a better ripple filer, it starts running the risk of voltage drops which is the main thing I want to avoid. The ripple is almost not visible. We are taking 2mV average ripple so its basically nothing. But I will keep experimenting as should a second design be done, I may update some things in the future. I have spent some time testing efficiency. 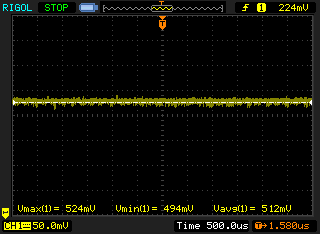 1amp on the 5V rail works out at 84% efficient. 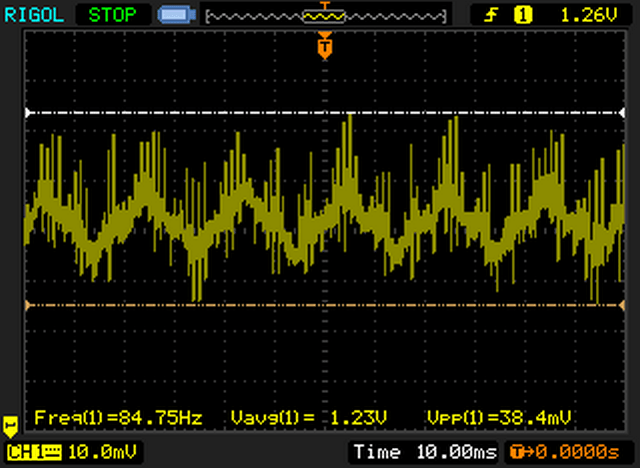 2amps works out at 82% efficient. This is really good for a low cost solution. The regulators probably don't need a heatsink for 2amps load. Though I have loaded it up to 4amps and efficiency starts to drop and the regulators start getting warm. Most ST's operate below 2amps so it works out well anyway. Looking at a Phihong switchmode of 240V 0.6A input is 144watts input. The maxium output wattage is stated as 39watts. This would yelid a efficiency of about 56%. During a typical ST load of 2amps the switchmode section of my PSU can operate at about 86% efficiency. The bulk of the losses are in the switching regulators themselves. Hopefully in the future more efficient regulators will become available. The toroidal I have not checked, but typically there are around 95% efficiency So the best overall efficiency of my PSU it likely to be around 80%. The maximum output power would be around 60watts which is the limit of the transformer. Overall the PSU is optimised for the best efficiency running possible based on a typical STFM machine load of 2amps. The second batch of PSU's now have a small PCB ontop of the regulator with 2 SMT capacitors on. This is NOT a modification to the design. The capacitors were being soldered on the bottom of the PCB on the regulator pins themselves. Only this was turning into a small nightmare in soldering. So the capacitors are now ontop of the PCB on a tiny PCB. Also , some boards had 2 resistors on the bottom, now there is only 1. 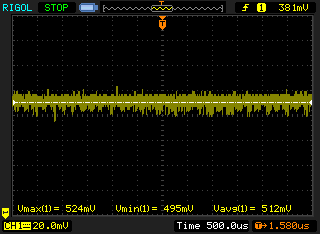 The resistor biases the 5V line zener to trip out at 5.5V. I couldn't get the exactly voltage zener diode so had to bias with a resistor. Some boards may now just have 1 resistor as I changed to a different brand of zener to which needed a slightly different resistor value where it was a value I could actually get. 2 Inductors (lighter gray in above image) have been changed for a slightly larger type. I managed to find a larger value inductor with still low resistance, so I used them. In theory the larger inductor should have given slightly better ripple figures, but didn't seem to change anything. So there is no advantage to either inductors which have been fitted. At some point in the mix the SMT diodes have been changed. I managed to find some lower voltage drop diodes so later builds will have those. This doesn't effect the performance, but may help with gaining marginally more efficiency. Later batches will be missing a small capacitor and 2 resistors. 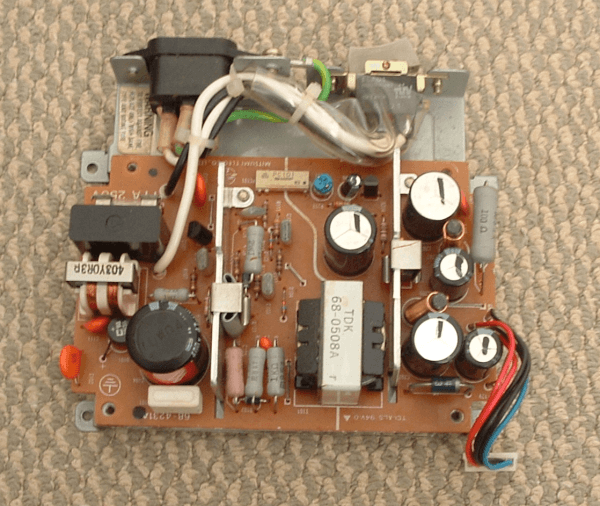 It was a small RC delay network to delay the turn on for the regulator but its not required. Some capacitors may be changed for larger values or physically larger types in due time. While the cost is higher with larger capacitors, I am generally using similar values for my PSU re-cap kits. So in order to reduce the amount of stock I have to keep buying, it will allow me to use the same capacitor values in multiple projects. There are some possible mods listed below. Both are non-crytical "faults" and unlikely anyone will have these issues. Though in case someone does, then they can do the mods as listed below. If you do not have the issues, then there is no need to do the mods. You can however still do the mods if you so wish. I don't know of any issues with these symptoms on PSU's which have sold so far. Though there is always that chance that someone may run into some odd issues in the future. Generally later batches have had the modifications done already. As mentioned above there have been some minor changes over various batches. I have had problems with tolerances on the "4V" zener diode. Where I later soldered a resistor or 2 on the bottom of the zener to correct the trip voltage. However its possible some zeners might be even more out of spec than I initially found. No ill effects will happen other than the 5V trip voltage being "over sensitive" which results in random blowing of the fuse. 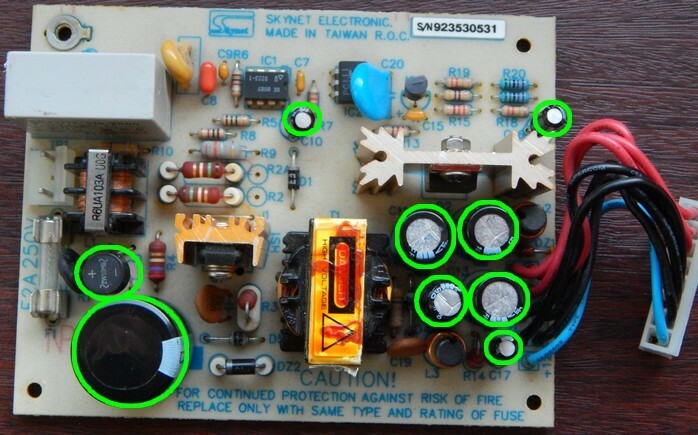 To check the trip voltage, a meter need to be placed on 0V and the "back end" of the 4V zener diode. One end will measure about 5volts, the other should measure somewhere around 0.20V-0.30V or lower. 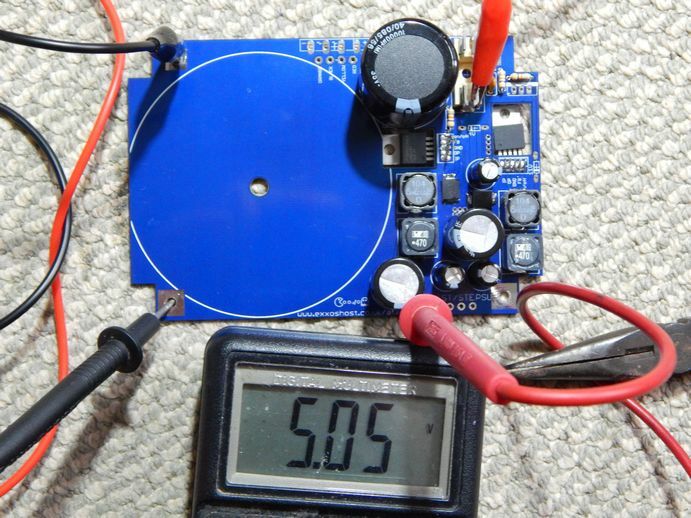 Due to tolerances on the SCR the trip voltage can be anywhere between 0.4V and 0.6V. So if the zener voltage is higher than about 0.3V then it may run the risk of blowing the fuse for no reason at all. 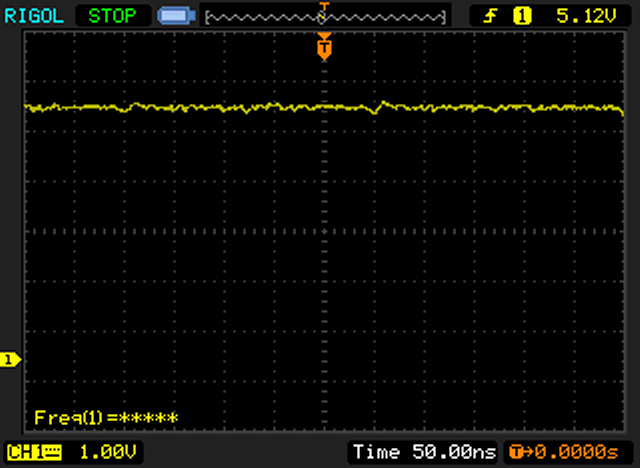 The SCR should not trip until 0.6V though again with tolerances on parts its possible for it to trip at 0.4V. 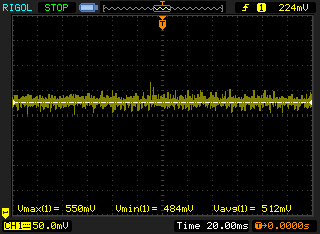 So I suggest anything over 0.3V is start to get a bit close to tripping. Typically I worked out the values to trip at 5.5volts. Though I did not expect the tolerances to vary so much, so the "typical values" fitted might not suit all PSUs. Of course all PSU's have been tested before I send them out. Though as parts warm up over several hours of use, they may drift enough to blow the fuse. Should the voltage be higher than 0.3V then I suggest increasing the resistor values on the bottom of the PCB (soldered under the 4V zener) by about 100R-200R and try the zener voltage again. This additional resistance should be in series with the existing resistors. Typically the value there already will be about 2.4K, so the value should end up being 2.5K and 2.6K. Do not increase the value to high otherwise the trip voltage could end up being over 6volts. The zener diode and resistors are removed and a new zener used in its place. This zener is a BZX79-C5V1 diode and manufactured by NXP. 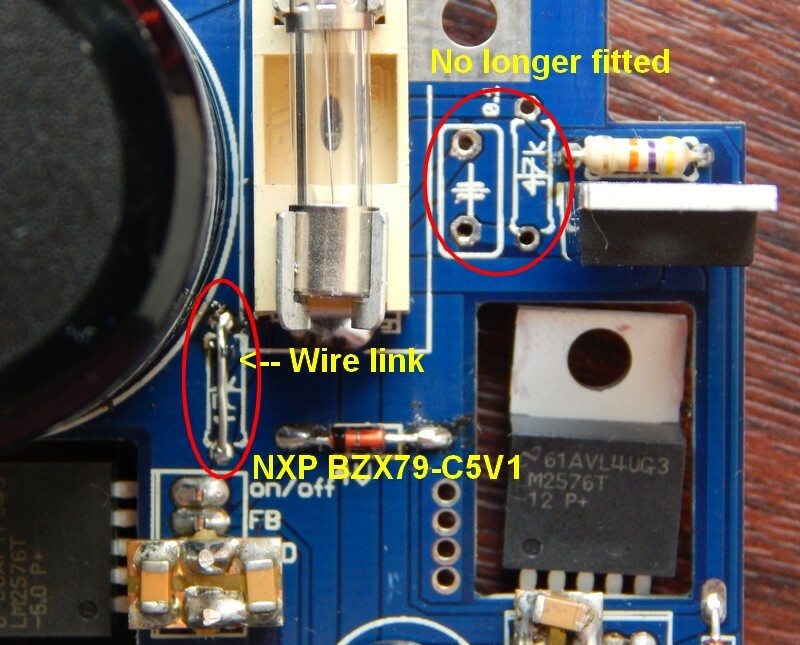 I have not tried other brands of diodes, though the NXP ones , at least so far, seem to be the ideal ones to use. If you do not have a problem with the fuse blowing, then there is no need to do the above fix. MOD2 - "soft start" power up fix. Later revisions have this "feature" was removed. The fault would show up as showing 3volts on the 5V rail, simply because the regulator was turning off and on very fast. After about 30-60seconds the PSU would work normally. If you have this problem then there is a 47K resistor near the 4V zener (near the left regulator itself) needs to be removed and a wire link placing there instead. This will make the regulator as "always on" so it removes the possible power up issue. 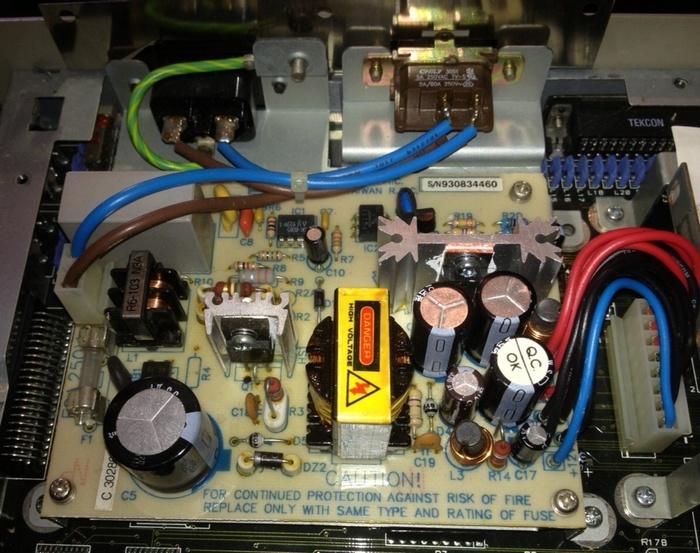 In later builds of the PSU, there is a 47K and small capacitor missing near the SCR on the top right of the board. Those parts are no longer fitted and no longer needed once the first 47K resistor is linked over. If you do not have this issue then there is no need to do this fix. The Falcon PSU is a tweaked design of my ST PSU. Mostly moving over to more SMT based parts. This allows me to assemble them a bit quicker. The main change is I changed the rectifier out for four Schottky diodes with a lower voltage drop. I thought the rectifier got a little hot so efficiency would suffer slightly. So the change to SMT Schottky Diodes allows much cooler running at will increase the efficiency of the PSU. 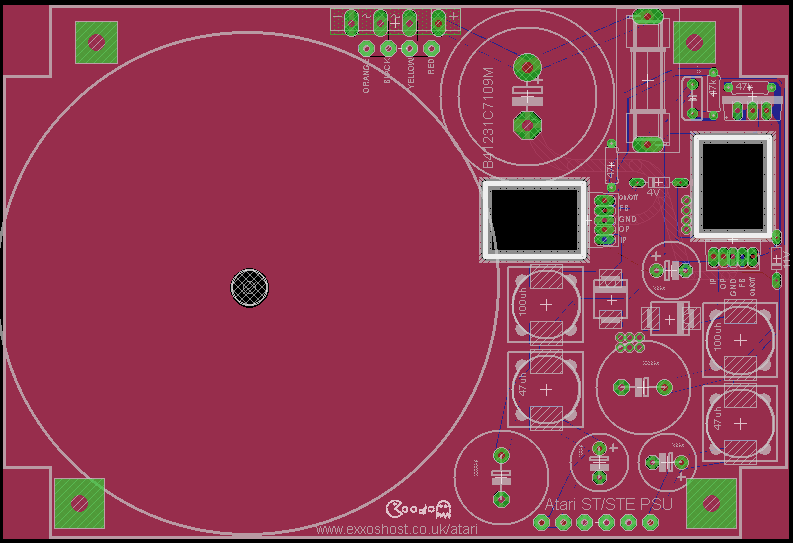 The PCB sees some minor layout changes. The 12V regulator has been moved so it can now be bolted onto the chassis. There isn't likely any need for it to be bolted unless something heavily uses the 12V line, which is unlikely, but I have not checked. In any case, this 12 V regulator I advised be bolted down. The PCB copper thickness has doubled and I have used more tin plating to keep track resistance down. 5V actually came out at 4.95V on the ST design due to just a few millimeters of track! Amazing! The thicker copper now shows the proper 5V level. 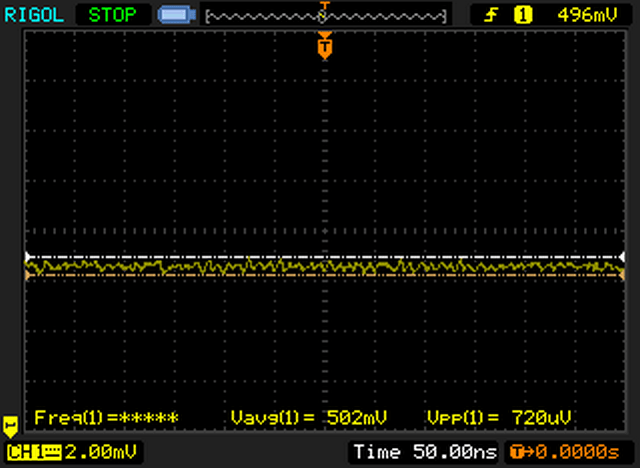 Marginally increases efficiency, but this voltage drop was more of a annoyance than anything. Some parts of the PCB have also been tinplated to keep resistance down. The PCB corner holes have been made a fraction larger as there seemed to be some alignment issues on some of the metalworks on some PSU's. It is difficult to manufacture a "one size fits all". Though while some hole alignments may still be tricky, it is still a improvement over the previous layout. There have also been some slight capacitor changes in values. Generally higher capacitance's are now used. While this increases my production costs, I just had so many capacitors for various things I just had to limit the stock of stuff I was having to buy. So now the 2200uF capacitors have been replaced with 4700uF which is also used in many of my re-cap kits. This is also considerably lowered the ripple of the power supply. Image below is on x10 setting, 720uV is 7.2mV. The 12V line under a 1amp load is a fraction better at about 5mV noise. I looked at available inductors to see if there was any better ones on the market, but without much luck. One manufacture claimed better ratings than the inductor I am currently using, but it was worse tolerance and resistance wise. So I decided to stick the the inductors I am using already. The only lower resistance ones are flat coil wound types, theres are at least twice the size and there simply isn't room on the PCB for them. Lower resistance inductors would increase efficiency slightly and run cooler. Though it would be marginal. As mentioned before with the ST PSU design, while lower resistance is always better, they are twice the size and 5 times the cost. Such inductors would add a extra £10 to the PSU price, so IMHO its not really worth the "gain" in using them. This Falcon PSU will include the motherboard connector. Its not viable to re-use the one from the original Falcon PSU as the cables are simply not long enough. Extending the cables or changing the cables and pins would have to be done. Likely this would cause issues for people who don't have crimping tools etc. So the Falcon PSU is supplied with the motherboard connector. The crimps are gold plated! and the cable used is the thickest I can get to fit in the crimps. Its worth noting (again) that the main system ground is actually the metalwork itself. So technically the 4 black wires to the PSU connector are not needed. 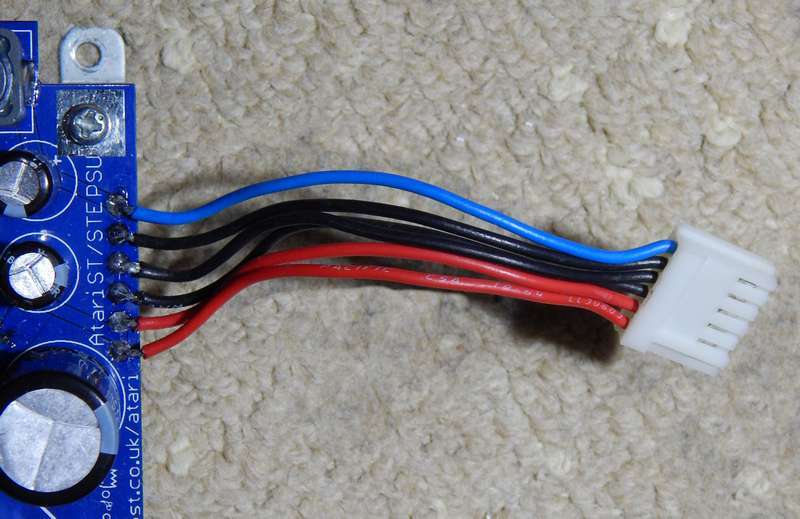 Though I will be supplying the connector will all wires connected as a extra layer of saftey in case of a bad ground between the chasis and motherboard ground. There are now more holes in the 5V,0V,12V outputs. The Falcon has more cables so the PCB needed more holes for the power connections. This PSU design will replace my original ST PSU design in due time (No use producing 2 designs of basically the same thing). Though the Falcon design for the board will be somewhat higher due to higher PCB costs and other parts changes. The connector is not fitted for the STFM versions (like my ST PSU design was supplied). The Falcon PSU will have the connectors, but is a lot higher priced due to more work and costs involved. Though people can still buy the PSU without the connector if they want to do that themselves. THE ABOVE PSU'S ARE NOW DISCONTINUED (2018) ALTERNATIVES ARE AVAILABLE. SEE LINK BELOW FOR PROGRESS & NEWS. Firstly you need to get some tools. Basic stuff really. Soldering iron, solder, side cutters, 3BA nut spinner (or pointed nose pliers) Phillips 1P & 2P (cross head) screw driver, IPA swabs, drill with 3mm drill bit, heat transfer paste, scribble stick. Medical plasters are useful if your prone to cutting yourself on metalwork. I strongly recommend Arctic Silver 5 paste and I really wouldn't bother even trying to use anything else. I have personally tried and tested MANY pastes over the past 10 years and the AS5 is a long term reliable product with great heat transfer properties. So here goes.. Firstly you need to remove your old PCB board from its metal chasis and cut off the 2 mains wires to the PCB. Once removed there is normally a plastic sheet glued on top of the metal base (as was under the PCB) this needs to be removed. 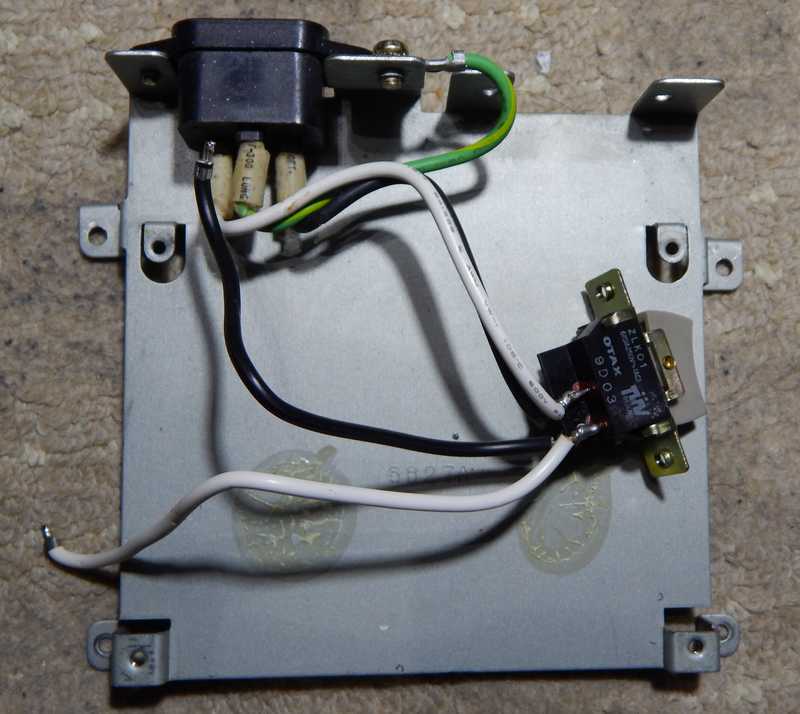 Also there is normally a plastic "hood" over the mains switch which needs to be removed also. Take the 2 screws out of the switch. Next screw the new PCB onto the metal base (it fits in the same holes as the old PCB). Don't tighten up fully as the PCB will be removed again shortly.. NOTE - because of so many variations of metal base, some people may find the holes do not align perfectly. But it is still possible to screw all 4 holes with a little effort. It just a "tight fit". Take your favorite scribble stick and mark out the regulator hole as shown below. MAKE SURE THE REGULATOR IS LAY PERFECTLY FLAT AGAINST THE METAL BASE BEFORE DRAWING THE HOLE. UPDATE- If you have the Falcon PSU version then you need to also drill holes for the second regulator. At this point double check nothing on the solder side of the PCB is touching the metalwork. 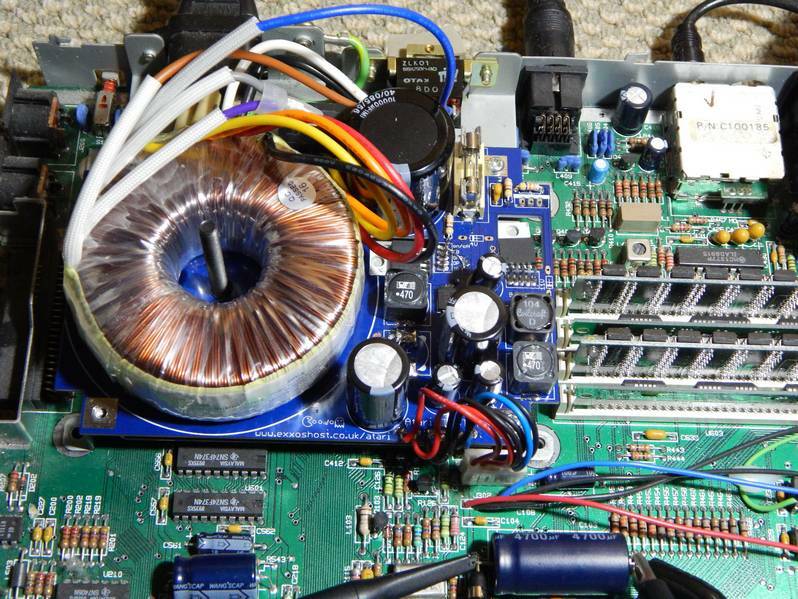 Simply look at the edge of the PSU PCB and see if anything is touching or close. While generally I do check this, please double check and trim any wires if necessary. Now remove the PCB then drill a 3mm hole where you marked for the regulator. Make sure you have no burrs either side of the metalwork. File off is necessary. Note - The other regulator is the 12V one and does align fully with the metalwork :( Thankfully the 12V regulator doesn't get warm even under a 1amp load so it is not necessary to bolt it to the base. Clean the highlighted areas in the image blow with IPA cleaner or IPA swabs. Once cleaned, apply the AS5 paste as shown around the drilled hole. Note- As the metalwork is used as a additional GND connection for the PSU board, I would recommend using anticorrosion paste as sold in my store. This will prevent the air from getting to the contacts and stop them from corroding or oxidizing. The paste will improve conductivity long term also. Screw the new PCB back into place loosely and push the bolt though the bottom side of the PSU, place the waster on top then the nut and tighten up along with the 4 PCB mounting bolts. NOTE - On older style boards where the ROMs are under the PSU in sockets, the screw will touch the top of one of the ROM's. If this is the case, then the ROM must be taken out of its socket and soldered into the motherboard. Next up is to solder the PSU to the switch. Now there are 2 ways. Either reuse the original switch (yuck!) or if you purchased a new switch from my store (yay!) , then follow that set of instructions. Both methods are listed blow. Pretty straight forward. I would suggest the switch wires be resoldered so they are traveling to the right. Otherwise the PSU switch solder tabs may touch the PCB and that would be bad! Cut off the yucky old switch (cut wires close to the switch) , and burn it while videoing it then upload it to youtube. Smashing it with a large hammer is also acceptable. Reuse the old bolts and put on the 3mm nuts as shown in the image above. The blue wire (neutral) on the transformer goes to the neutral (white wire) on the mains socket. The black wire (live) goes to the switch as shown. 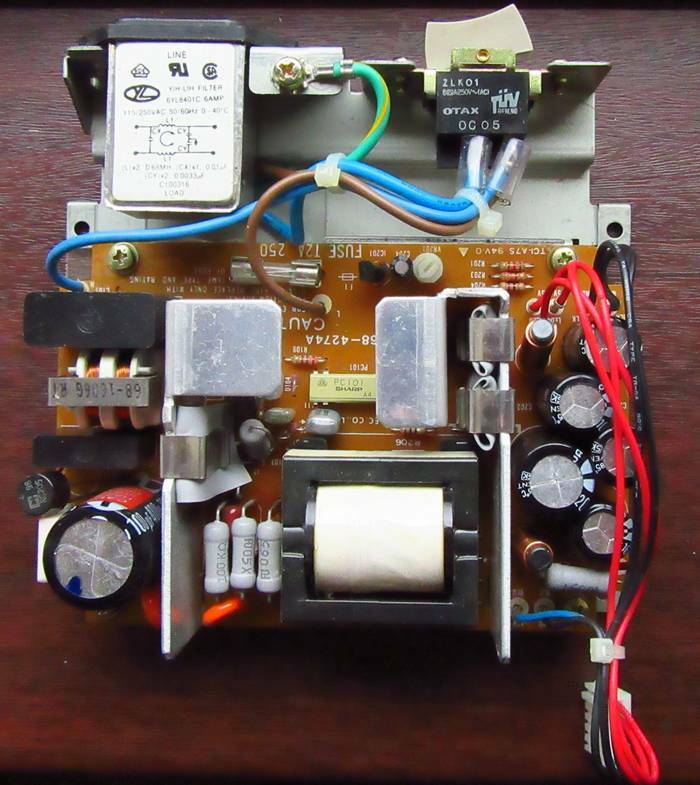 Then the brown wite of the transformer (live) also goes to the switch as shown. The 110V transformer wiring is slightly different than the 230V one, but very similar. While the 230V transformer wires have BLUE and BROWN wires, the 110V has the same wires but paired with GREY and PURPLE. These are generally twisted together when I ship them, and should be wired as shown in the above image. Cut off the old PSU power connector and solder it onto the new PSU as shown. All sorted :) I would suggest the PSU be tried externally (out of the ST) to ensure everything is well before powering up your ST. The PSU will show approximately 5.05V off load and 12.05V off load. When fitting the new PSU, the PSU metal cover will most likely need to be left off as there is no room left height wise to fit it. Also if you are fitting your own transformer in particular, all wires should be kept as short and as low down as possible. Otherwise the transformer wires may push up on the Atari case plastic.